Denmark, and especially it's capital Copenhagen, has both a long history and strong tradition for the art of tattooing. So it might come as a surprise that Denmark is one of the few countries in the western world that does not host a regular tattoo convention. For more than ten years there has been no public expo into this colourful and very popular art form for the wider audience. That is about to change. Big time! The first weekend in April 2011, Carlsberg's old, now totally modernized, 8000 capacity brewery hall, in the centre of Copenhagen, will open it's gates for the largest Scandinavian tattoo festival ever. 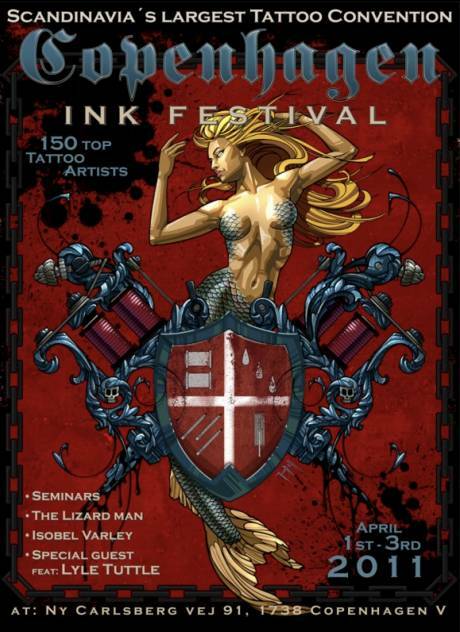 Over three days, 150 of the world's finest international tattoo artists will be showcasing their skills and working on the audience, garnered with side-show entertainment, competitions, freakshows and other fine and raw arts associated with the aesthetics and lifestyle of tattooing.